Despite completing a largely successful first full year as Apple CEO, Tim Cook will earn 99 per cent less than he did in 2011. The boss, who took over from the late Steve Jobs in August 2011, will bring in $4.1m (UK£2.5, AUD$3.9) in 2012, as Apple sales and stocks hit record levels under his stewardship. However, the figures are somewhat deceptive. At the end of 2011, Cook earned a gigantic $375m (UK£232 AUD$360) stock windfall on top of his basic salary and bonus pay. In fact, his 2012 salary went up over half a million dollars, from $900,000 (UK£558,000, AUD$866,000) to $1.4m (UK£860,000, AUD$1.34) in his first calendar year as the ruler of the roost in Cupertino. 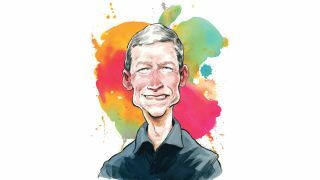 Most observers would argue that Cook has led Apple admirably in the last 12 months after stepping into some very big shoes. Product sales have been through the roof and the stock price is still up a third since he took over, despite the recent slump. However, bigger challenges will face Cook in the forthcoming year, amid an increasing feeling that Apple may have peaked. The increasing threat of Android in the smartphone and tablet game, as well as the damage to its reputation caused by the Apple Maps debacle and the ongoing patent protection suits, will encounter Cook in the New Year.